The New York Knicks sit seventh in the Eastern Conference after 10 or so games in the young season. They got rid of the poison that was Phil Jackson, traded away Carmelo Anthony after years of mediocrity and mockery followed Carmelo and the Knicks for what seemed like forever, and managed to keep their franchise player in tact after Phil Jackson wanted to trade the cornerstone before the start of this season. They were fixing some of the issues that almost seemed impossible to get out of, and finally coach Jeff Hornaceck could initiate the kind of offense that he couldn’t run when Phil Jackson was keeping him in a cage. The Knicks sit 8th in assists per game at around 23 assists per game, after falling near the 20th spot in assists last year, and players like Tim Hardaway, and rookie up and coming stud Frank Ntiikina are playing big supporting roles so far in the young season. But the most important factor in the Knicks turnaround from last year is the seven foot sharpshooting dragon that is Kristaps Porzingis, and his ability to make MSG loud again. The New York Knicks have something they didn’t have under the Phil Jackson Asylum the past couple years, and that something is freedom and the ability to fully trust a coach without having to implement a tired and unfitting system to the progressive style the NBA has matured into. Jeff Hornacek has always been a good coach, or at least a coach i liked. He helped make that fun 2012-13 Suns team into a 500 plus wining team, and just shy of a playoff spot in the loaded west. Before that though he was a well respected assistant with the Utah Jazz, and help with the development and growth of some of their youngest and brightest stars. The Madison Square Garden of New York is the greatest building on earth, the Mecca of basketball it’s nickname for years and years. Though, with such a nickname associated with MSG, the Knicks have struggled to find that excitement in the fan base, and to have a loud and hopeful MSG on their side. But their franchise man and guiding light Kristaps Porzingis has brought a hopeful future for the Knicks now that all the chips in his his hands. Carmelo Anthony was traded to Oklahoma, and when that trade happened it gave the finale nod to Melo ISO ball in New York, and finally after years late Kristaps Porzingis found the keys to the Knicks Offense. Kristaps Porzingis is having his best year in his short 3 years in the league, and is developing more and more aspects of his game day after day. 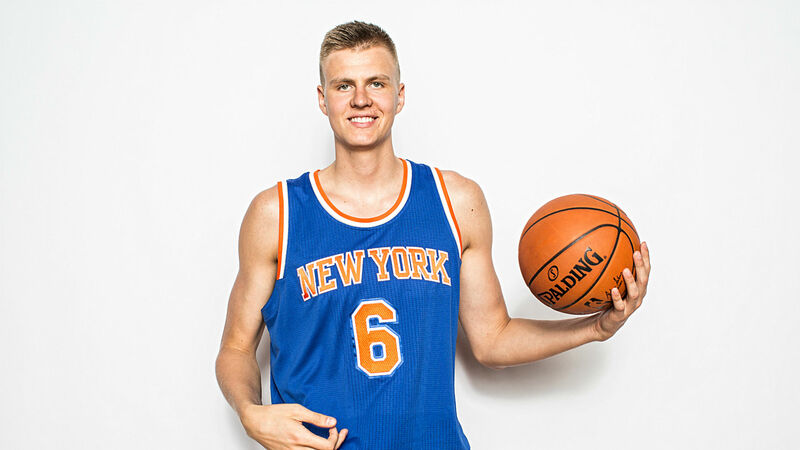 His true shooting percentage-which measures a players shooting percentages with 2 pointers 3 pointers and free throws combined- Is at a career high sitting at near 60 percent at .592%, and he is the go guy for the Knicks, having a career best usage percentage at 35%, it shows trust in him and Porzingis comes ready to deliver almost every game. New York is a brash town with bright lights and sports fans with about as loud of a voice on what their teams do or should do than anything. The City is a live performing art at times, with nonstop action and noise bouncing off the high skyscrapers and condos that control the environment of this at sometimes intimidating city. But Kristaps is a tall man standing at seven feet and three inches, and he seems willing and ready to lead the way for the Knicks. Being a leader in New York is never easy, as you have the eye of the media and fans on your every move from morning shoot around to game time, it can be really hard to fill the shoes of the past and to not be scared of the spotlight. Kristaps Porzingis has let his game speak for him, and if the way he plays now is the way he plays in the future, he has the whole city in his hands and the basketball word in his hands.